What’s on tap this summer at the Baltimore Museum of Industry (BMI)? Consider two recent events which showcased Baltimore’s burgeoning business climate. First, on June 25, the BMI hosted the Maryland Distillery Showcase. Aptly titled “Spirits of Maryland”, the event featured more than a dozen of the state’s premier hard liquor producers. And on July 13, BMI members and guests journeyed a few miles east of the Inner Harbor museum to Highlandtown for behind-the-scenes tours of Mark Supik & Co. Woodturning and Monument City Brewing. Mark Supik & Co. and Monument City Brewing share portions of an old veneer manufacturing-turned-pajama making factory at 1 North Haven Street in Baltimore. Both businesses are relatively small, family owned and operated affairs. 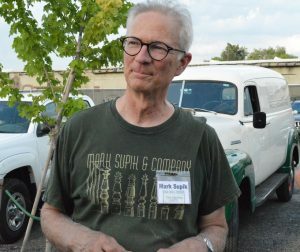 Mark Supik & Co. was founded by its namesake in 1981. Brothers Ken and Matt Praay launched Monument City Brewing in 2014. Touring the two businesses, the pride in ownership was evident in the wares the respective concerns produce. Also evident was the reality of a day in the life of the dedicated craftsmen. Never mind amenities such as air conditioning when you tour such working facilities. In brewing beer, high temperatures are part of the process. 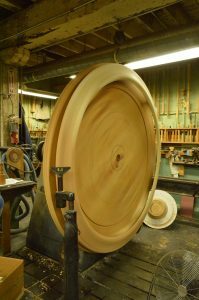 As for the wood shop, industrial fans and fast-turning lathes provide just enough of a breeze to keep the crew and most visitors content. Mark Supik told the Baltimore Post-Examiner, “We don’t stock anything. Everything we do in the shop is special order.” Special orders, we learned, are a key to Supik’s business and the finished products are an architect’s delight. The company may not stock any finished mill products, but outside, a huge cache of reclaimed wood sits basking in the sun. To the casual observer, the piles of wood have the making of a fabulous bonfire. The shop will use the salvaged wood for tap handles someday. Inside, John Supik walked us around several works in progress. These included a just finished newel post ball and a six-foot circular table piece. “We’ll work from drawings and pictures but also use salvaged examples for restoration pieces,” explained John. One such machine is a large band saw that dated to the late 1800’s. On any given day, the craftsmen might be working on a single restoration project. Or they may be turning furniture parts, spindles & balusters, balls & finials, newel posts, curved architectural moldings and columns. “We do everything from a single piece to small runs in the hundreds. Ninety-nine percent of the wood we use is harvested on the east coast. Mahogany, cherry, poplar, along with various reclaimed woods,” John said. Then there are the tap handles. 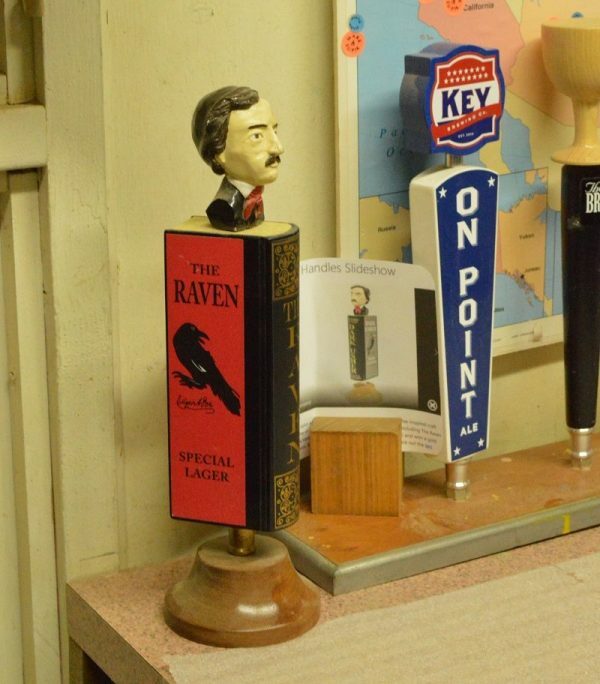 Mark Supik & Co. is the largest maker of beer tap handles in the United States. Their 40-page catalogue showcases hundreds of designs. Some designs are surprisingly intricate, while others are executed with simplicity and serviceability in mind. 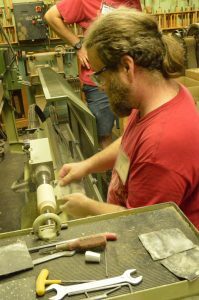 “I can turn 25 or more an hour on this copy lathe,” said mill specialist Matt Saindon. “Especially with one of the more simple designs that doesn’t have many cuts. I could actually do more on a faster machine, but with this one, we’re able to better control the quality. At the end of the day, it has to pass muster. The finished products – past and present – are on display in the in-house museum. But for a demonstration, we just needed to walk next door to the tap room of Monument City Brewing. Andy MaClellan – Assistant Brewer at Monument City Brewing – cheerfully guided us through the beer-making process. Our 20-minute tour included stops before carefully stacked kegs, steaming stainless steel vats and pallets of pleasing grains. Penchant Pils, American Brown Ale, Battle IPA and the award-winning 51 Rye make up the core of Monument City’s product line. All are packaged in 1/2 kegs, 1/6 kegs, and 12 oz. cans. Seasonal brews include intriguing names like Among the Pines Double IPA, Crooked Window Belgian Dubbel, and Rooftop: a pineapple-mint IPA. 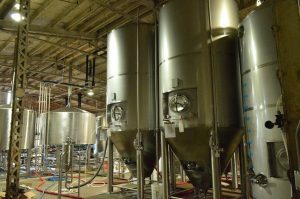 Each brew cycle nets Monument City Brewing about 31 gallons per barrel. Owner Ken Praay later told us the company’s current output is about 3000 barrels a year. Winding our way about the factory, we saw areas where new construction is taking place. MaClellan said the company will soon be adding more tanks and a canning line. At another point, we observed two brewers carefully force-carbonating the brew with a special high pressure apparatus. Our final stop on the tour was a long, folding table, set off to the side, replete with test tubes, beakers and other laboratory equipment. MaClellan said the equipment belongs to a PhD. student from Johns Hopkins University who is working three days a week at the brewery. The student checks for crucial concerns like the yeast cell count and purity of the product while keeping a weather eye out for harmful organisms in the beer. The beakers seemed oddly juxtaposed against the backdrop of the huge brewing vats, but they serve as a synergistic reminder that there is a real science behind the art of brewing beer. One quick correction: the final stop for most on the tour was not the laboratory table. It was the cozy beer garden for a pint of one of Monument City’s brews. The Tap Room is open to the public Thursday – Saturday, with Friday nights set aside for live music and food (BPE favorite Jacob Panic is appearing there tonight.) And for those interested in learning more about the art of woodturning, Mark Supik & Co. does offer classes. Many thanks to Mark Supik & Co. and Monument City Brewing for two fascinating tours. And thanks to the Baltimore Museum of Industry for once again demonstrating that industry in Baltimore is not just a thing of the past.